Here is a selection of local groups. If you are a local group with an interest in promoting your service via this page please contact the Clerk. Thorpe offers many different and varied activities, for toddler groups to exercise classes. 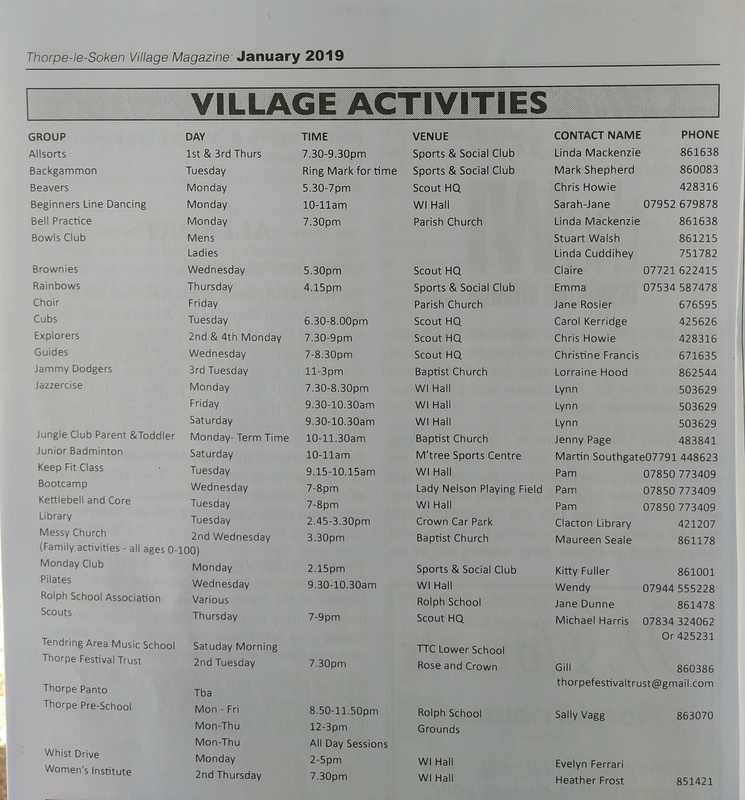 Please click on the button below to view the days and time of Thorpe local activities. Saint Michael’s is a friendly parish church with emphasis on the family and on Christian teachings. Everyone is welcome to visit or to join us for worship. Thorpe baptist church was established in 1802. Set within its own grounds which are lovingly maintained providing a pleasant walkway and entrance to the building. The Scout Group is always keen to try and find some more helpers and Leaders particularly for it’s youngest section called “Beavers” who meet at the Jim Keeble Scout Centre. Full training is given to all occasional Helpers and leaders, and not all the roles involve wearing uniform. Please contact our Group Scout Leader by telephone on 01255 428316 or email chrishowie63@btinternet.com for more information. A group set up to participate in consultations on changes being proposed to NHS Family Practitioner Services in Thorpe-le-soken and neighbouring villages. Please click on the button below to view a questionnaire for completion and return to the Surgery. Rainbows (5-7 year olds) is all about developing self-confidence, building friendships, learning new things and having fun. Girls get their hands dirty with arts and crafts, get in touch with nature and play games – it’s all about learning by doing. Brownies (7-10 year olds) introduces girls to a world of new opportunities, challenges and fun. camps, holidays, day trips and sleepovers. They get together with their friends at regular meetings where they learn new hobbies, get creative, explore other cultures and have outdoor adventures. As well as trying activities in their meetings, girls choose from interest badges related to things they want to know more about. Guides (10-14 year olds) create their own campaigns, learn and share new skills and fly down the occasional zip wire, explore new places – Guides go on camps, holidays and trips, enjoy exciting events.